Students examine an interactive map overview of ancient Egyptian civilizations. Then, they watch a video about farming the Nile. 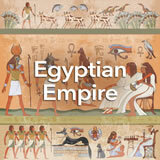 They explore Egyptian social structure and economy. Next, they explore the Egyptian hieroglyphic writing system. Digging deeper into Egyptian farming and economics, they learn how Egypt‚Äôs social classes made use of a proto-banking system based on grain surplus. Finally, they learn about the Rosetta Stone, whose discovery in 1799 enabled modern people to decipher hieroglyphics. 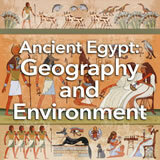 In this experience, students examine an interactive map overview of ancient Egyptian civilizations. Then, they watch a video about farming the Nile. They explore Egyptian social structure and economy. Next, they explore the Egyptian hieroglyphic writing system. Digging deeper into Egyptian farming and economics, they learn how Egypt’s social classes made use of a proto-banking system based on grain surplus. Finally, they learn about the Rosetta Stone, whose discovery in 1799 enabled modern people to decipher hieroglyphics. This experience contains a lot of content. You may choose to teach it over two sessions in order to spend adequate time on the various elements of ancient Egypt’s development. 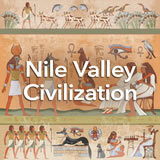 Describe the social, political, and economic development of the Nile Valley Civilization. Explain the development of language and writing that came out of ancient Egypt and their significance. 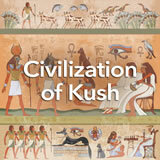 The civilization of ancient Egypt lasted for thousands of years. Its echoes can still be heard in modern civilization today. In this experience, you’ll learn how the civilization first developed, including its farming, its society, its government, and its unique writing system. Early Egyptian Pottery 4000-3500 B.C.E. 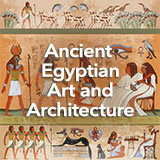 To learn about this great civilization, begin at the beginning by going to Ancient Egypt. Read the text on the front page and then look at the illustrated map to its right. You’ll find many labeled red circles that you can click for information on specific topics. Read the sections “Farming” and “Egyptian Writing.” Within the popup information, click the additional red links and explore the information. 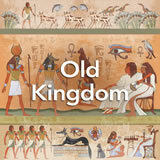 The Ancient Egypt website contains a lot of information, presented in an appealing way. Give students enough time to explore. They need only explore the “Farming” and “Egyptian Writing” sections, but they may read more for a fuller introduction if time permits.